Yesterday, we released a new study with the Tent Partnership for Refugees that finds that as many as 2.1 million working-age refugees live in major urban areas in developing countries where employment opportunities are likely to be close by. We have known that about 60 percent of refugees globally live in urban areas. Our study shows that 38 percent of working-age refugees in developing countries live in major cities of 300,000 or more people. This is important for a few reasons, but primarily because it further dispels the inaccurate but frequent depiction of refugees living in desolate camps. 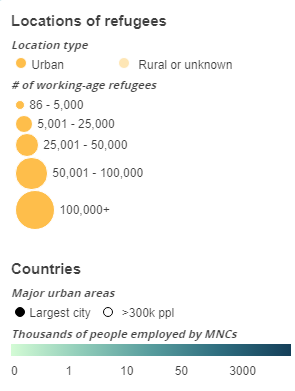 We also found that up to 7 countries have at least 50,000 working-age refugees in or around major urban areas, up to 11 have at least 25,000, and up to 17 have at least 7,000. Among these 17 countries, the large majority have between 1,000 and 10,000 people employed by multi-national corporations (MNCs) with OECD home countries, and about half have more than 10,000—suggesting that many MNCs are in close enough proximity to hire refugees and supply from their businesses. The study also includes an interactive map (depicted in Figure 1) that displays the locations of working-age refugees in relation to major urban areas in 31 developing countries. The map provides information about each refugee location and the refugee situation in each country, including whether each location is urban or rural and the total number of refugees in each country. The boundaries and names used on this map do not imply the expression of any opinion or acceptance by the authors. To conduct our analysis, we looked at the geographic overlap of refugees and major urban areas in 31 developing countries. These countries were selected based on two criteria. First, based on data from the UNHCR 2016 Statistical Yearbook, we included all developing countries that were hosting at least 25,000 refugees and people in refugee-like situations at the end of 2016—a total of 37 countries. Second, we excluded countries that did not have enough refugee location data to conduct the analysis. This left us with 31 countries. Once we had our sample, we used demographic and location data from the UNHCR Statistical Yearbook to map the locations of refugees in relation to major urban areas. Using data from the UN’s 2014 World Urbanization Prospects report, we defined major urban areas in two ways. The first definition, which we used for a high estimate of overlap, considered major urban areas to be cities with a population of least 300,000 people. The second definition, which we used for a low estimate, considered major urban areas to be the largest city in each country. The map of Cameroon in Figure 2 provides an example of how the analysis was conducted. Of the six urban areas with populations of least 300,000 people in the country, refugees are located in two: Douala and Yaoundé. 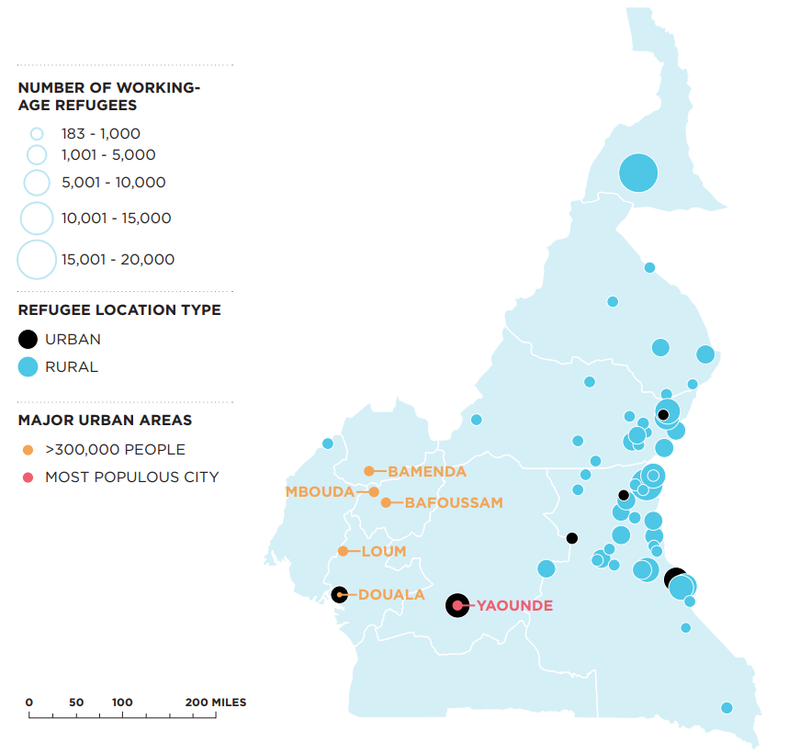 Out of a total of 375,415 refugees in the country, there are 9,290 working-age refugees located in Douala and Yaoundé —this is the high estimate of overlap. There are 5,506 located in Yaoundé, the largest city—this is the low estimate. The study also outlines the main barriers to employment for refugees, including laws that bar refugees from employment and owning a business, as well as discrimination, skill mismatches, and restrictions on mobility within a country. For example, in most developing countries, refugees do not have the legal right to work. And if refugees cannot access formal employment, MNCs and other businesses may not be able to hire refugees, regardless of proximity. Many refugees work informally, but these workers are more vulnerable to exploitation, and a lack of access to formal work restricts their economic opportunities. And, as we will show in a forthcoming paper, providing refugees with greater labor market access can be beneficial not only to refugees and their employers, but also to their host countries in terms of labor market outcomes, fiscal effects, and economic growth. To address these barriers and unlock the mutual benefits of refugee labor market access, there are a number of actions that MNCs, local business, and policymakers can take. Working in partnership with others, MNCs can leverage their stature and role in developing economies to engage in policy dialogues and promote greater rights for refugees. They can also work with local businesses and business associations to combat discrimination and prejudice toward refugees by disseminating information about refugees and their skills. Businesses, donors, and NGOs can work together to provide language and skills training to refugees and job matching services. Other development actors— such as the World Bank, which has new investments in addressing protracted displacement—can leverage their policy voice and funding to facilitate employment opportunities at scale that reach both refugees and natives.